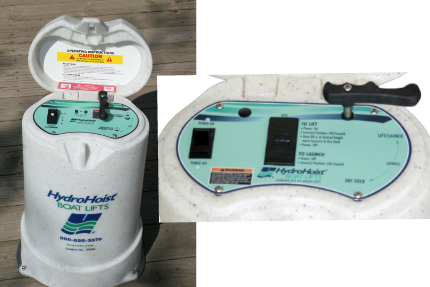 HydroHoist is the only boat lift manufacturer to offer three, yes three, boat lift control options. We boast one of the industry’s most innovative line of controls. Our remote control, HydroLaunch, allows you the ability to sync your boat lift operation and your dock’s lights with the remote and control it from up to 500 feet! All of our HydroHoist Boat Lifts come with the standard control option unless otherwise noted. Contact your local HydroHoist Boat Lift Dealer about upgrading your boat lift’s operational controls today. Have an old control? Upgrade! The Push Button Control packageuses automatic valves, eliminating the need for handles and levers. One button to lift, one to lower, and one to stop makes using your lift effortless.